Ever since Feb. 10, Guilford has been looking for a rematch with the Runnin Royals. 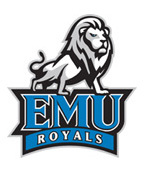 In a regular-season Old Dominion Athletic Conference contest, EMU throttled the then-No. 1 Quakers 90-63 in Greensboro, NC. On Saturday, Guilford got its rematch, again on its home floor, as the ODAC rivals met in the regional finals of the NCAA Men’s National Championship. This time around the Quakers withstood EMU’s early charge and grabbed a 90-80 victory. When the two teams met in February, Eastern Mennonite put the clamps on the Quakers’ three point shooters and ran away with a 90-63 win. With a Final Four berth on the line, the Runnin Royals started out by forcing Guilford center Tyler Sanborn (Mount Airy, NC/Elkin) to lose the handle on the ball and then got a three pointer from George Johnson (Richmond, Va./Miller School) to take the first lead. EMU continued to rain threes and pushed to a 9-6 lead. The trend from the first meeting continued as the Royals hit five three pointers in the first seven minutes while Guilford didn’t get a triple until the 12:20 mark. That bomb from Clay Henson (Glen Alpine, NC/Freedom) tied the game at 19-19, erasing a 17-10 edge. Henson hit another to give the Quakers their first lead since the opening minute. The senior hit his third after an EMU turnover to put Guilford up 25-21. D.J. Hinson (Newport News, Va./Menchville) scored six straight to put the Royals back ahead and the teams traded leads for until Guilford took a 36-29 lead. The Quakers inflated the small edge in the half’s final minute but Hinson drained another three to close the frame, leaving Guilford up 47-40. The first 20 minutes saw some blistering shooting. After a rocky start, Guilford hit 70.4% of its shots, including 5-10 threes. EMU was a solid 15-32 for 46.9%, including 9-20 from long range. Hinson hit an incredible 6-of-10 triples and had 25 at the break. Henson led the Quakers with 15 while Sanborn added 14. Hinson tied the EMU record with his seventh trey early in the second, but the Quakers calmly pushed the lead to 12 at 57-45. Hinson came back with another three at 16:59 to break the school mark, but Guilford was not impressed and stretched the cushion to 62-48. The Runnin Royals got a couple of transition layups and trimmed the lead until 10, but the Quakers got a three-point play from freshman Josh Pittman (Archdale, NC/Trinity) to steady their control. Sanborn finally pushed the lead past 14 with two free throws at the 7:22 mark, making it 80-64. EMU finally tried to attack the rim, but the Quakers suffocated the interior and pushed their lead to 84-65. Johnson hit a three pointer, but the Royals went cold for two precious minutes before the junior would hit another one. The Royals started fouling at the 2:30 mark, and two free throws followed by a steal and layup pushed the lead back to 17 for Guilford. The spurt effectively iced the game as EMU couldn’t force steals and had to settle for fouling. Johnson nailed a three with 48 seconds remaining to trim the edge back into single digits. But time ran out on the Runnin Royals as Guilford held on the 90-80 win. Hinson racked up 37 points for EMU, including a school record eight three pointers, but it wasn’t enough. Johnson finished with six of his own bombs and finished with 20 and a game high six assists. No other Royal scored more than seven points. Sanborn hit his traditional double double with 26 points and 14 rebounds. Henson provided the outside punch with four three pointers and a total of 25 points. The Quakers were nearly unbeatable, hitting 61.4% of their shots in the game. EMU finished with a solid 45.3% clip. The Royals finished 15-38 as a team from three-point range. The men also forced more turnovers, 17-11. Guilford had a 41-22 rebounding edge, which was aided by their hot shooting. Eastern Mennonite ends its best season ever with a 25-5 record while Guilford advances to the national Final Four next weekend.